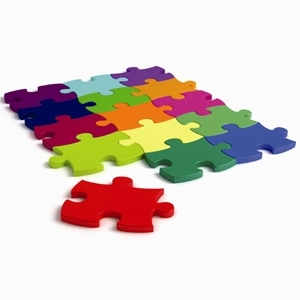 I often feel that building a brand is similar to solving a puzzle. Only, branding is a puzzle with about 5000 pieces and 50% of the pieces are hidden in other rooms of your house. I don’t mean to say the client or your team members are pilfering pieces intentionally, it just kind of happens. You see, no matter how much research I do, how many hours I spend on a project, or how much data I review, I truly feel that I will need to rely very heavily on my team and my client to complete the puzzle. The client is the one with the vision, they work on the frontlines, they know who their target audience is, not based on statistics, but based upon personal relationships they have developed with them. That being said, the client does not always know best. A company is not a brand. The client may know everything about his or her company, but in the end, it is designers, copywriters, social media experts, and marketers with the ultimate vision. So how do we leverage from the client’s wealth of knowledge, while retaining authority, and eventually completing our branding strategy? In this article, I will discuss my branding process, and how working with your client and team, rather then for your client and team (or worse, against your client and team) will lead to a successful result. Whether you are a designer, a marketer, a retail sales worker, or a restaurant server, we’ve all experienced it- clients from hell. What would you say if I told you that you never again had to deal with such a client? You’d be pretty interested in what I have to say, right? Well, you never have to deal with a problem client again; you simply have to do two things. The first thing you need to do is choose the right clients. In my opinion, a design project should be a marriage, not a fling. A marriage will have its share of ups and downs, but common values will ultimately keep you afloat. A designer-client relationship is no different. When you first meet a potential client, take into account how they act, what they say, and how they say it. If your client is in a hurry, the whole project will be a rushed disaster. If the client is cheap, it’s unlikely that he or she will be willing to pay for necessary updates or customizations throughout the project. If he or she acts as if the design is a commodity, and not a necessity, run away fast. If the client doesn’t appreciate you and your expertise from the beginning, well, in the words of the great Snoop Dogg, “drop it like it’s hot.” While this practice may leave you with fewer clients, it will surely lead to a higher percentage of quality clients. The second thing you need to do is stop saying yes all the time. When a client asks you to make the logo bigger, or to use light gray type on a white background, you are in no way obligated to carry out those tasks. You are the authority and you need to act like it. If you concede to every request, the client will surely walk all over you. Encourage their feedback, but be sure you understand why the client is requesting the revisions. If their argument is valid, make the change. If not, state your case and hold your ground. As I mentioned earlier, your client is going to be one of your greatest sources of information for your branding project. All too often, marketers rely on analytics and numbers and data to give them answers. And while there is nothing wrong with this logical approach, I personally feel that it fails on a very important level- that of the user. To many marketers, a user is a click, a conversion, a form fill-out. But to me, a user is so much more. A user is a living, breathing opportunity. To some, a user should find your site, easily access information, carry out the desired action, and continue on their merry way. I agree; a user should do all those things. But here is where most analytical marketers and designers differ. Good marketers and experienced designers want this whole experience to take place, and they want it to be enjoyable. If a user finds a site enjoyable, they are very likely to return. If a user does not, they may fill out a form, or sign up for a newsletter, but their return is not probable. Instead of pleasing your potential customer, you’ve grabbed their email address and will probably spam them with annoying coupons or newsletters until they are so fed up they just unsubscribe, thus losing the potential sale forever. This is where your client becomes extraordinarily useful. They can assist you in creating an accurate profile of target users. They know what their users like, how they act, what they look like, their age range, gender, etc. With this information, you can create a general experience for your target audience that feels highly customized to individual users. Although your client stores a wealth of experience and information, and you have years of experience in the design industry, you are going to need much more than that. Your next step in crafting a successful branding strategy is assembling an A-team. You’ll need help from copywriters, social media specialists, marketers, developers, engineers, etc. Each of them will bring puzzle pieces to your table. It is important to note, however, that you cannot simply choose anyone to take part in the puzzle. In “When to Fire a Top Performer Who Hurts Your Company Culture,” published in the Harvard Business Review, Eric C. Sinoway discusses how hard-working, thoughtful, trustworthy team members are far more valuable even if they aren’t necessarily the top performers in a company. I have always agreed with this notion. I’m a firm believer that you can teach someone skills like writing, designing, or engineering, but one thing you can never teach someone is to care. In my opinion, if a team member doesn’t have heart, he or she may as well have no experience, because he or she will never go the extra mile for your team, and always only be looking out for oneself, rather than the good of the project, client, or company. Just as you take great care in choosing your clients, do the same when assembling your team. Choose team members with big hearts over big egos, with willingness to learn over experience, and I guarantee you won’t be sorry. Once you’ve assembled your team of all-stars, it is time to come up with an actual game plan. As I mentioned in my last article, I find it crucial to have an initial discussion with the client before the project really begins. Arrange a time to speak, and include all necessary members of the team. After the first phone call, I like to speak with the team and formulate a detailed strategy. Include every step of the process, and assign a date to everything. Create a schedule and confirm with your team that each deadline is realistic, and that time allotted for tasks is accurate. Be sure to take client review time into account as well. If client approval is necessary to move forward, give the client a few days to review, and a few days after that for the team to make any revisions necessary. Earlier this week, my team and I put together a plan for a large-scale branding project. The schedule carries on well into June. June? It’s not even April yet! Won’t the client freak out at such a faraway deadline?! No, he or she won’t. A client will only freak out when you promise an early deadline and don’t meet it. It is far better to under-promise (or at least realistically-promise) and over-deliver than the opposite. As long as your plan is detailed, broken up into several “mini-deadlines” and you maintain a high level of communication throughout the project, a distant deadline won’t be a problem. Ask Questions, Ask Questions, and Did I Mention, Ask Questions? I send a questionnaire to the client to review and answer soon after the initial phone call is completed. Be sure your client understands that this is a mandatory step. Do not let the client call you up to answer the questions and do not let him or her skip this step. It is very important to have all of this information in writing from the beginning. It not only serves as an excellent resource for each member of your team, but can also helps to narrow the scope of the project and assist you when the client has feedback. Although the branding process can be very daunting, it is much easier when you pay attention to detail. Begin by choosing clients that appreciate your expertise, and work well with your team. Next, assemble a great team that you trust, taking into account values and ethics over experience level. Be sure to create a realistic plan that makes sense for both your team and your client, and to ask plenty of questions throughout the process. Set realistic expectations, and surpass them. Do all of these things, and I can practically guarantee that the finished puzzle will be an appreciative team and a happy client. Does your company need branding or rebranding, but doesn’t know where to start? Contact us today for a detailed strategy!